Two channels of handheld wireless in a single package. 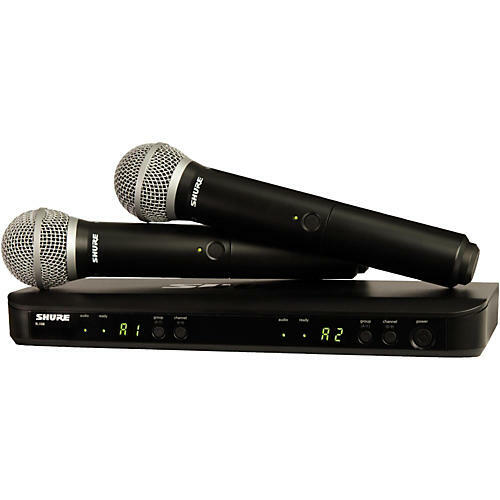 The BLX288/PG58 system features Shure's dual-channel BLX88 receiver and a pair of BLX2 transmitters, each equipped with a Shure PG58 mic capsule. The transmitter features the popular PG58 mic capsule, a rugged and reliable ABS polymer chassis and frame, a 10 dB pad, an On/Off ergonomic push-button switch, and a single bi-color LED battery indicator. It has a rugged windscreen and has a comfortable size and shape. The receiver is a tabletop design with XLR and 1/4 in. outputs, and features one touch QuickScan technology, which examines the room and the available frequencies, and selects the best one. Order today and free up two singers at once. Line of sight:	300 ft. Battery runtime:	Up to 14 hr.